When Bru's Wiffle joined the Santa Monica breakfast scene last fall it almost couldn't fail. The casual breakfast arena was so deprived (outside of a hungover visit to Snug Harbor and a few others), it didn't really matter how good the food was. Luckily, the waffle joint ended up being really good. And more than just a breakfast joint. They serve lunch Tuesday through Sunday and now feature dinner on Friday and Saturday nights. 1. How did Bru's Wiffle come about? The name/the concept? JM: Bru's wiffle is the longterm dream and ambition of Ebru Fidan, the Turkish born entrepeneur that came to the United States in the early 2000's with a dream. Her dream was to be the coolest character alive with the best food you've ever tasted, and to serve that food to you... On waffles. You know what happened? She did it. She decided that she was going to do it. After working at one of West LA's finest establishments for years, Ebru decided to start her own. She brainstormed with friends and eventually one thing became clear... Ebru (Bru) needed to be the star. "Bru's Wiffle: A Waffle Joint!" came about after many tastings and many exclamations and hugs. Why? Because it's cool, it's catchy and based on no research, we thought other people would like it too! 2. Describe what your first year has been like. JM: It's been insane! There have been strange moments, new recipes, new guests, recurring friends and everything else you can imagine. 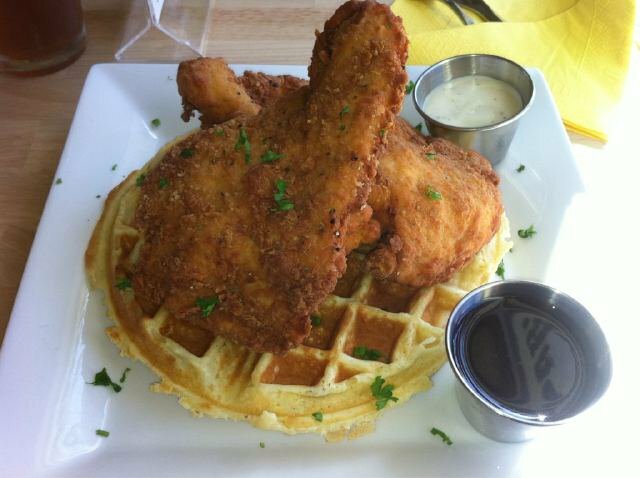 After months of focusing on pizza waffles, waffle and meatballs, Elvis inspired dishes with peanut butter, bacon and banana 'Bru thought that she could step up... She was going to provide LA with never-frozen fresh fried chicken and waffles. You know what happened? People went crazy. The flavors that we've created in the past year are something we never imagined, and we are only going to get better from here on out! 3. Do you like any other waffles in LA? JM: Roscoe's is a completely different experience. 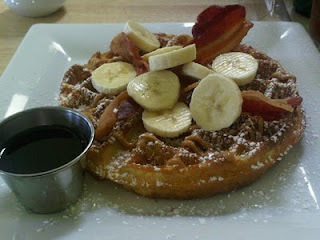 Their waffles aren't Belgian style, and ours are... But we've been there and we love their style. 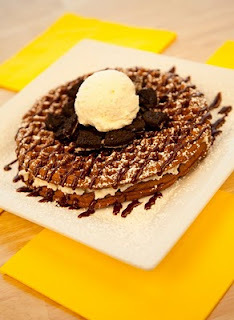 We've been to The Waffle too... We aren't going to say that we don't like any other waffles... We just really like the hint of vanilla bean in our recipe that makes our waffles dance on the line of sweet and savory. 4. 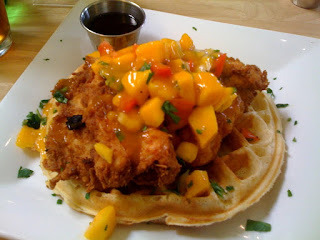 Do you ever get sick of waffles? Like at home, do you make pancakes for the hell of it? JM: You know the funny thing? There's a turkish dish that looks like a meat pie that Ebru makes... it's called a Mina meat pie or something similar. It's amazing. The closest thing available at Bru's Wiffle is the WET BURGER. It has a very similar flavor and spice sensibility in burger form. Lucky? You bet our customers are. This is a delicacy! 5. The question on everyone's mind: will the Unemployed Eater Breakfast Sandwich ever make its way to the permanent menu? I looove Brus Wiffle! Thanks to this article I will probably be there within the next couple days.